There is a buzz of activity in the kitchen at Tierra restaurant in Lyme Regis. It is the morning of a new seasonal menu change and Mark Evans, owner of the vegetarian restaurant, along with his sous chef, Channing are busy chopping, blending, mixing and macerating vegetables of every kind, working hard to bring out the best in their produce. Entering its fifth year in Lyme Regis, Tierra is firmly established on Lyme Regis’s restaurant scene. Chef Mark is brilliant at creating dishes full of flavour, driven by the seasons and subsequent produce available. In a way, he says, the menus write themselves. 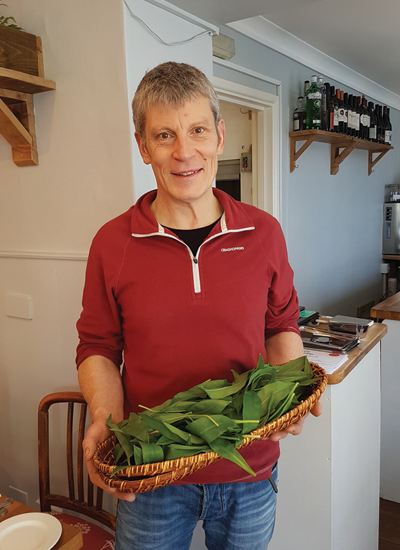 For instance, only the day before he was out walking his elderly Jack Russell, Geaves, and couldn’t resist stopping to collect the first of the wild garlic to make into arancini. Also being crafted are nettle and feta mini filos, while cauliflowers are marinated in the corner, generating mouth-watering aromas. Mark moved to the area partly because of the freshness of the ingredients and closeness to the sea, but also because he wanted his children to grow up here. Previously in Bristol, his vegetarian restaurant, Café Maitreya, won award after award. However it was time for a change and Lyme Regis attracted Mark as the right spot for his new restaurant. Now, close to hand, samphire and seaweed often feature in his dishes. Mark has written a couple of cookery books to date, and is about to publish his third; Naked Tierra, bursting with vegan and gluten-free dishes. Working 60 hour weeks he doesn’t get so much time to himself. What time he does get he spends with his two children, as well as looking after the U11 Lyme Regis football team, which his son plays for. At night, Mark might be found relaxing at home, dreaming up new recipes, with some reggae music bouncing around the walls.